Hello, My name is Muskan Salim Malik. I am an Akshaya Patra beneficiary from Gujarat. I am studying in Standard VII at Kavi Narmad Prathmik Shala, School No. 156, Surat. My parents believe firmly that contemporary access to schooling is a concrete path to educational attainment. At several instances, I have seen Abbu (my father – Mr. Salim Malik) promote learning and foster societal attitudes toward education among his circle of friends. I am glad that despite of the social stigma of educating a girl child, he has been supporting my school education that too under some of the most challenging circumstances including opposition from aging family members. I want to see my father’s head held high by becoming a Professor and shaping the next generation of scholars and academicians! I have an interest in learning languages. Urdu and English are my favourite subjects. I would like to specialise in literature and writing, as I believe in their transformational power to cross boundaries. As a professor, my objective more than anything, would be to assist students to broaden their horizon by helping them visualise from other’s perspective too. We are eight members in the family - my parents, three sisters, two brothers, and me. My brothers are also studying. It does become difficult for my parents to arrange for wholesome meal each day. 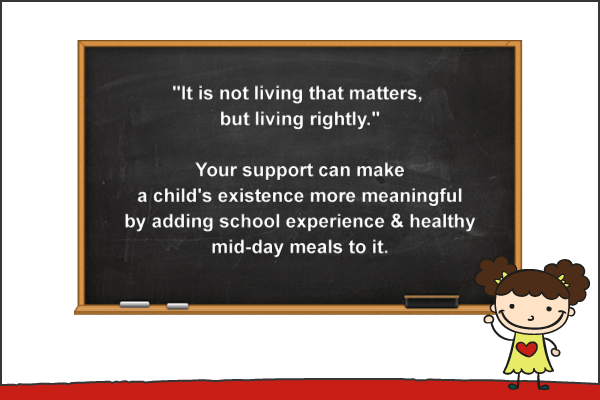 I thank Akshaya Patra for the healthy mid-day meals that come as a blessing in disguise to me. Khichadi, sabji and thepla are my favourite mid-day meals.